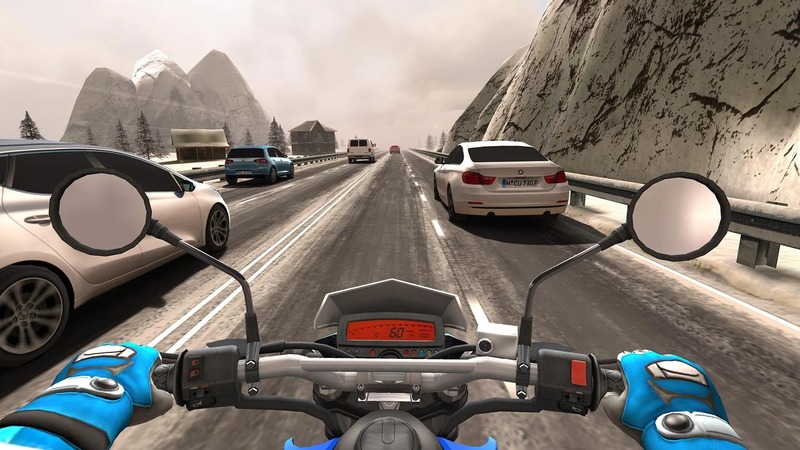 In addition to high-end car racing games such as Asphalt 8 or Need For Speed, also the motorcycle racing game is quite attractive and has a large number of players as well. There are a lot of motor racing games but in part because of poor graphics quality, another part due to too many advertisements that inhibit players, so hard for players to choose. 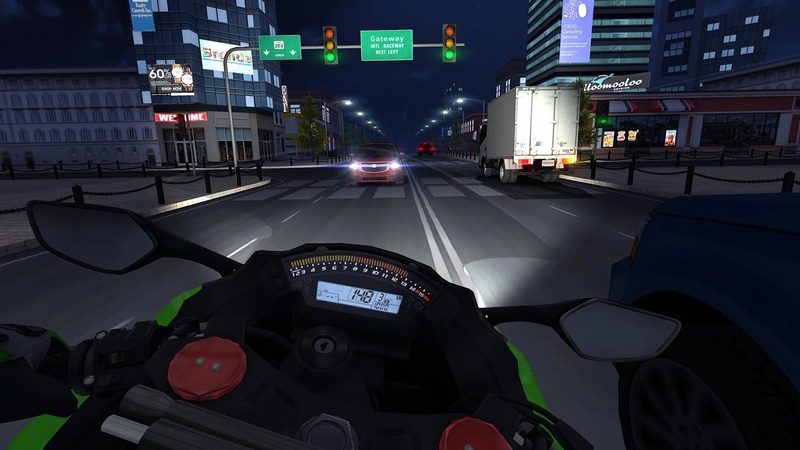 But not at all, and a name that is not one of them, is the famous motor racing game of Sonar Kara with hundreds of millions of installs called Traffic Rider. Traffic Rider has no ads? The answer is yes, but the way that Sonar Kara placed the ads in this game is very “minded” when the ads only occupy a small part of the main screen and at the end of the game, moreover their ads themselves turn off. Not full screen, not catch the user click ignored as the other free games. If you are a speed enthusiast, you can try Traffic Rider to experience expensive supercars or try your reflexes in front of highways, only one distraction can cause you to lie down. The endless arcades, the challenging levels and the supercar models that you dream in real life cannot see waiting for you to participate. 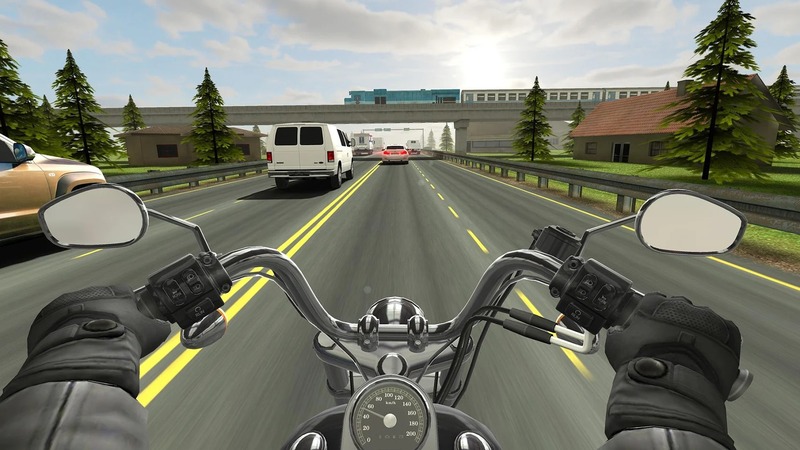 Initially, the player will only be given a motorcycle with a maximum speed of 100 Km/hr to practice driving. On the highway, you will have to control the car at the highest speed possible, avoid other vehicles and achieve the goal set by the game. Once completed, you will receive a bonus, which can be used to purchase expensive motorcycles. 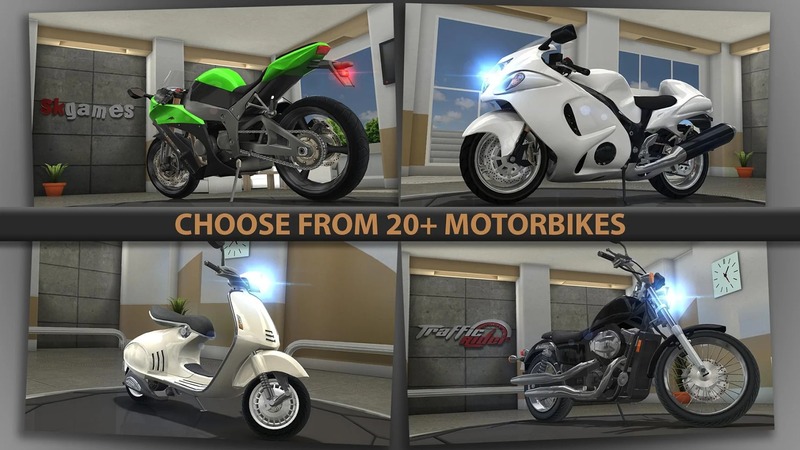 These motorcycles are usually very expensive and you will have to accumulate a lot of bonuses. To reach the big bonus you need to reach a minimum speed of 100km/hr and try to avoid the vehicles on the road as close as possible. In the game, the landmarks that you will have to cross will show up on the map. Each level has the required landmarks before you can unlock another. Milestones with the G symbol are completed, not showing what is being done, but the padlock icon is unopened. For a racing game, the fun part is definitely driving. Control is not too difficult, there are two virtual scales on the sides of the screen. To slow down, you can use the brakes and release the throttle, reverse when you need to accelerate. But there are many hazards on the road that you have to be careful but not slow. One is not wonderful, two is not achieved the requirements of the game. Particular care must be taken with weather and time when it rains and at night will affect grip and vision. Car horn icon: Remote warning to other vehicles give way. In terms of graphics, Traffic Rider really good. The game is built on a state-of-the-art game engine, delivering the ultimate gaming experience. You can notice the game meticulously from the formation of the car, the background, the highway, even the weather and the collision in the game was unexpected. Most importantly, more than 20 supercar models, such as ARTIL TP4, YNH S1 and DCT 89 10H … have designs based on real life, like 99%. In addition, the sound system is surprisingly large, you can hear the sound of the motor no different than the motor in real life. According to the developer, these sounds are because they record engine sounds and then incorporate them into the game, making the game more realistic and dynamic. Do you want to own these? There are over 20 different vehicles designed based on real life. Motorbike manufacturers such as Kawasaki, Indian, Harley-Davidson, BMW, Suzuki and Yamaha all have products in the game. It can be said that Traffic Rider has a lot of interesting things: many different game modes, different maps, and arcades. With more than 40 levels and many super motorcycles, sure you will have many memorable experiences. The game support for all three operating systems Android, Windows Mobile, and iOS.